PARIS, June 19: A record breaking night for Cristiano Ronaldo, but one he'll want to quickly forget. The Portugal captain certainly won't want a copy of the selfie taken by an intrepid fan, who evaded security to dart onto the Parc des Princes field after Saturday's 0-0 draw with Austria at the European Championship. The memorable image of Ronaldo's record 128th Portugal appearance should have been the 79th-minute penalty. 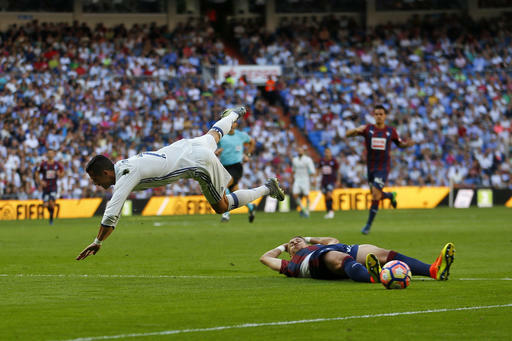 Instead, as goalkeeper Robert Almer dived to his left, Ronaldo struck the spotkick in the opposite direction and it crashed against the post. Ronaldo did find the net find minutes later, but there was no 59th Portugal goal for the forward as it was ruled out for offside and Portugal remains winless after two games at Euro 2016. It summed up another substandard game in France for Ronaldo, who is still waiting to score in a record fourth European Championship. "We have to take our chances," man-of-the-match Joao Moutinho said, without singling out Ronaldo for blame. If the Portuguese are as profligate in the final group game against leader Hungary, they could be going home early after also drawing their opening game against Iceland. Iceland and Portugal are both on two points, two behind Hungary. 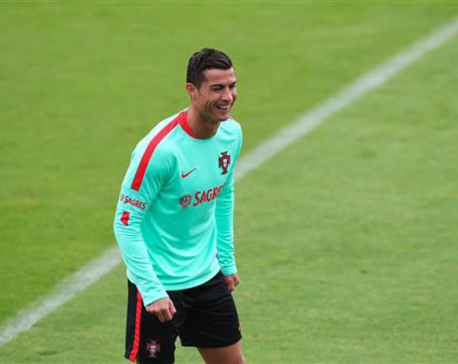 "We can't wallow in our own misery," Portugal coach Fernando Santos said through a translator. "There is a final to play on the 22nd — our first final of these Euros ... and then the team can grow." Austria is off the mark after opening with a loss to Hungary, ensuring a tight conclusion to Group F.
Austrian fans taunted Ronaldo early in the game when they chanted: "Messi, Messi, Messi." But the Austrians didn't have much to cheer from their own team after Martin Harnik missed the target after evading his marker in the third minute. After that, it was all Portugal — but all frustration. Austria goalkeeper Robert Almer was the initial barrier, blocking Nani's shot and tipping Vieirinha's effort wide in quick succession. After belittling Iceland's modest ambitions after last week's draw, Ronaldo wasn't living up to his own high standards in front of Luis Figo, whose appearance record he surpassed. Nani's interplay with Raphael Guerreiro on the left flank led to the ball being squared invitingly to Ronaldo but he sent the shot wide in the 28th. Ronaldo clasped his hands and looked up to the skies. The anguish was etched on his face and was there again 10 minutes later. Presented with another opening by Ricardo Quaresma, Ronaldo shot straight at Almer. It was a strong performance by Almer, who turned Moutinho's shot over after Nani header's came off the post before the break. The second half opened with Portugal goalkeeper Rui Patricio called into action for the first time, turning Stefan Ilsanker's shot away. But Ronaldo couldn't beat Patricio's opposite number. When Ronaldo spotted a gap in the defense to drive in a fierce shot it was turned wide by Almer and the goalkeeper parried the forward's downward header from the resulting corner. And don't mention set pieces to Ronaldo. He has now failed to score from 36 free kicks at major tournaments, stretching back to Euro 2004. The first in Paris hit the Austrian defensive wall and the second flew over the crossbar. Even when Ronaldo was hauled down in the penalty area by Martin Hinteregger, the Real Madrid forward couldn't seize the opening as his spotkick struck the post. "If this ball would have been a goal we could have returned home to Austria," Austria coach Marcel Koller said. "Now we're still in the tournament."